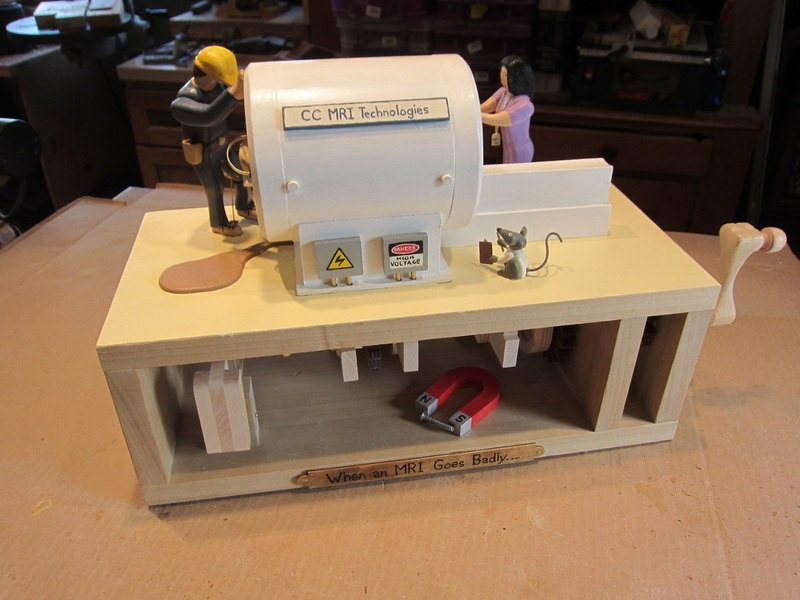 "When an MRI goes Badly"
The Story of "When an MRI Goes Badly"
This automata project was born from personal experience. I had an MRI recently because on a lower back injury. For me as a engineer it was fascinating to listen to the clicks and whirls and imagine the cool things happening inside the MRI shroud. For many other people however the thought of a having an MRI is intimidating. Many have worries about invisible electromagnetic waves pulsing through their body rearranging their organs. Being slid into the confined space in the tunnel is disturbing to many folks. but if you are claustrophobic it's downright frightening. So what better way to ramp up the whole paranoia business than imagining the MRI malfunction, ironically spinning the patient around inside the tunnel rather than the sensors moving beneath the shroud. Such is the story of "When an MRI Goes Badly"
As Herb the polka dotted underwear clad patient spins uncontrollably, Betty the MRI technician tries franticly to bring the machine to a halt by repeatedly pounding on the emergency stop button to no avail. Meanwhile, Ernest the hospital maintenance man who has a reputation as "old school" is not used to working on such complex machinery and the best he can come up with is repeatedly kicking the machine. It may have been this action that initiated the oil leak! Larry the Lab Rat, (who else did you expect to find in an MRI lab?) watches intently. Perhaps it was his nibbling on a cable in the bowels of the machine that started this medical spin drier in the first place! Anyway, the poor patient Herb, is getting the ride of his life - something to tell the grandchildren about. As an added extra, the wooden magnet on the base plate is actually magnetic and and attracts the small bolt holding it in place! A collection of a few photos of Herb, Betty, Ernest, Larry, and the MRI machine workings from the construction and completion of "When an MRI Goes Badly"